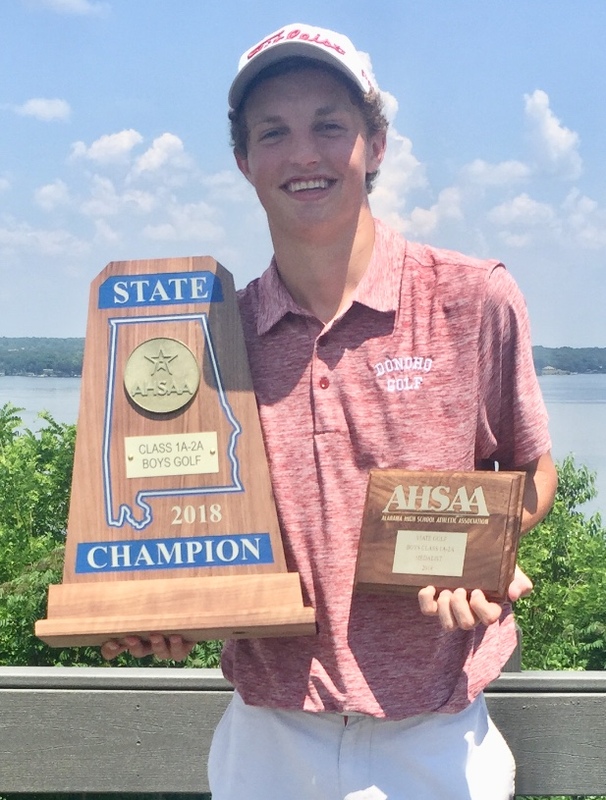 MUSCLE SHOALS – Jacob LeCroy and the Donoho golf team remembered what it felt like to leave the state championship last year close to the top but far off the pace. They turned the tables this year and left the competition in their dust. 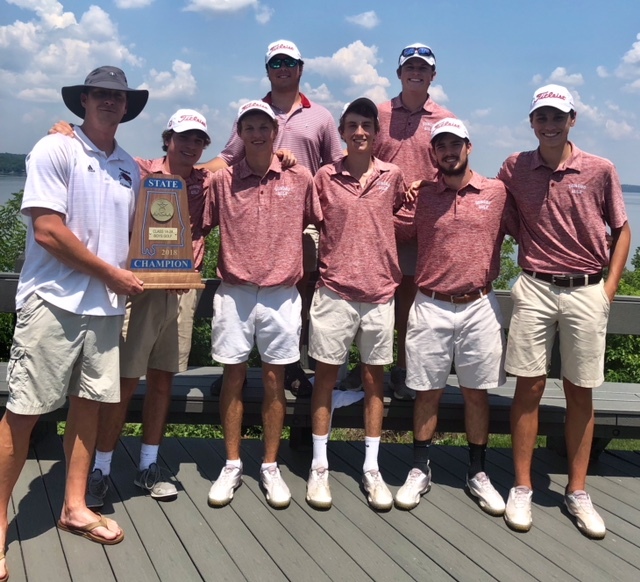 The Falcons shot 306 as a team Tuesday and won the Class 1A-2A boys state championship by a whopping 36 shots over the Westbrook Christian team that lapped them a year ago. They shot 614 for the two days. Donoho junior Jacob LeCroy shot 69-70 to win medalist honors and lead the Falcons to the Class 1A-2A boys state title. Westbrook beat them by 52 shots a year ago. LeCroy completed a wire-to-wire win for medalist as he shot a final-round 70 on the RTJ-Shoals Schoolmaster Course, turned back a threat from Westbrook’s William Wethington in the middle of the back nine, and by two shots. The junior shot 5-under 139 for the two days. Dylan Moulton of Kinston birdied four of his last six holes to finish tied for third with first-round co-leader Codey Cleveland of Red Bay (140). It was Donoho’s first state title in boys golf since 2007, when the Falcons shared the title with Houston Academy and there was no playoff. Such an momentous victory called for a special celebration. The leap into the adjacent Tennessee River was a little too far to be safe, so the Falcons waited until they returned to their team house and then jumped in the swimming pool with all their clothes on to celebrate. “It feels good to get that burden lifted off your back,” Donoho coach Garrett Burgess said. “Last year every tournament we played in we finished second; this year, every one but one we won. Besides LeCroy’s 70, the Falcons counted a 73 from county champion Harrison Hughston, a 77 from Jack Svensen and an 86 from Holden Abernathy for the final round. Buddy Ray shot 88, but his 79 on Monday helped put the Falcons in the position they were in going into their final 18 holes, so all hands had a hand in the title run. LeCroy, meanwhile, entered the day with a share of the individual lead and had built a six-shot lead over Wethington after seven holes. A double bogey on 8 in the midst of three straight Wethington birdies narrowed the gap and LeCroy was only one shot ahead after 12, but he wasn’t worried. He recovered with birdies on 13 and 14 – to pars by Wethington – and was never seriously threatened again. He had his favorite yardage into 13 – 60 yards – and spun a low 60-degree wedge back to about a foot; Wethington hit his approach short and got up and down for his par. Wethington hit it to five feet on 14, but LeCroy got inside him. Wethington suffered a violent lip-out on his birdie putt and LeCroy capitalized by coaxing his birdie putt into the hole. He had a three-shot lead with four holes to play. “I knew I had it there,” he said. But he still had finish. He walked up the 18th fairway with the lead and the team title in hand and lipped out a 20-footer for birdie on the final green to leave only a tap-in for the clincher. 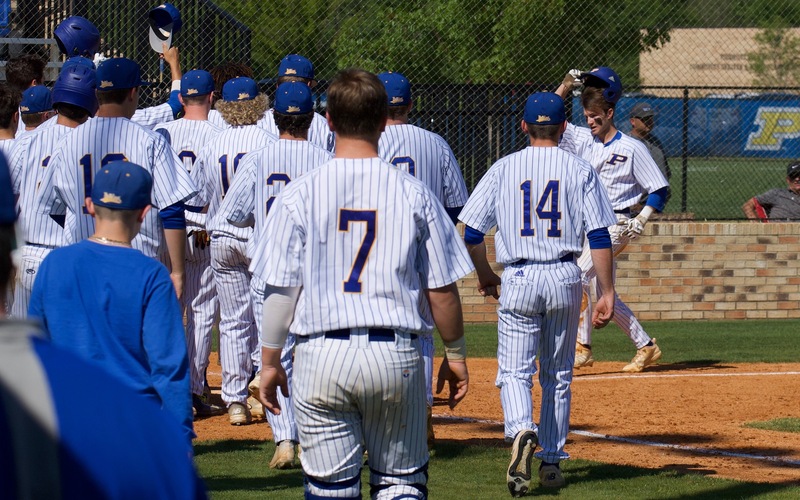 With the title, Burgess has now won a state crown as a coach and a player (Oxford 2005). “The kids wanted this way more,” Burgess said. “I think they realized if they were gonna do it, this was gonna be it; they have to make it count. Individual top 10: Jacob LeCroy, Donoho 69-70—139; William Wethington, Westbrook 73-68—141; Dylan Moulton, Kinston 72-70—142; Codey Cleveland, Red Bay 69-73—142; Harrison Hughston, Donoho 77-73—150; Nick Sawyer, Cedar Bluff 75-77—152; Jack Svensen, Donoho 83-77—160; Adam Ikner, J.U. Blacksher 75-85—160; Jackson Bowman, Westbrook 79-82—161; Buddy Ray, Donoho 79-88—167. Team scores: Houston Academy 292-292—584; Providence Christian 304-304—609; Glencoe 405-403—808; Pleasant Valley 463-452—915. Medalist: Thomas Ponder, Providence Christian 69-70—139. Glencoe: 7. Brock McNeely 78-73—151; 19. Justin Graham 108-105—213; 20. Jordan Yancey 108-109—217; 21. Garrett Fairley 111-116—227. Pleasant Valley: 15. Ethan Johnson 88-93—181; 17. Brooks Davis 97-97—194; 18. Adam Pritchett 99-104—203; 22. Damon Parr 179-158—337. White Plains, with three freshmen in the lineup, maintained its second-place position. The Wildcats shot 321 in the final round and finished well behind runaway winner UMS-Wright. Team scores: UMS-Wright 297-292—589; White Plains 313-321—634; Madison Academy 332-346—678; Haleyville 351-345—696. Medalist: Cole Davidson, Oneonta 66-70—136. White Plains: T-10. Gage Miller 74-82—156; 14. Kenny Okins 79-79—158; 15. Wesley Jenkins 80-79—159; 16. Nathan Griffin 80-82—162; 17. Andrew Miller 83-81—164. Hanna Dyar shot a final-round 76 to finish tied for seventh and White Plains shot the same score as a team they did Monday (246) to finish third. Northside’s Erika Allen shot a final-round 65 to overtake Randolph’s Michaela Morard by a stroke for medalist honors. Team scores: Northside 234-216—450; Randolph 237-241—478; White Plains 246-246—492; Trinity 253-248—501. Medalist: Erika Allen, Northside 71-65—136. White Plains: T-7. Hanna Dyar 83-76—159; 12. Lexie Cunningham 79-86—165; 13. Baylie Webb 84-84—168; 15. Allison Arenth 91-93—184. David Weeks expected his Oxford girls golf team would play better in the second round and it did. Three of the four Lady Jackets improved on their opening-round scores and the team shot two strokes better to finish third in their first-ever state tournament appearance. Kayla Huckeba shot 80 in the final round and finished eighth individually. Anna Bolton shot 86 and finished 12th. The Lady Jackets also counted a 113 from Kaylee Reaves. Bella Reaves made a 10-shot improvement over the opening round (128). Team scores: Muscle Shoals 239-232—471; Hartselle 248-246—494; Oxford 281-279—560; Homewood 299-309—608. Medalist: Mikayla Dubnik, Hartselle 72-70—142. Oxford: 8. Kayla Huckeba 86-80—166; 12. Anna Bolton 94-86—180; 16. Kaylee Reeves 101-113—214; 20. Bella Reeves 138-128—266. Glencoe’s Lauren Cole scored a hole-in-one with a pitching wedge on No. 16 of The Schoolmaster Course. It was her first ace and helped her finish tied for third after a final-round 76. The Lady Jackets finished fourth as a team. Team scores: Providence Christian 239-236—475; Bayside Academy 249-249—498; Clements 285-293—578; Glencoe 317-312—629. Medalist: Allison Howard, Providence Christian 74-75—159. Glencoe: Lauren Cole 77-76—153; Abby Powell 120-116—236; Camryn Blackwell 120-120—240.